Guillermo Del Toro’s Crimson Peak (Universal, Blu-ray, DVD) has been described, incorrectly, as Gothic horror. This is Gothic romance with notes of horror, bathed in the unreal and magical colors of a giallo and brought to life by Guillermo Del Toro’s beating heart of compassion in the face of evil. As lush and atmospheric a film as the American cinema has created in years, Crimson Peak stars Mia Wasikowska (whose wide eyes and open face evokes the gothic heroine incarnate) as a smart, passionate American heiress, the daughter of a self-made man (Jim Beaver as the model of paternal affection and American responsibility) and a writer with a romantic streak and an unsullied innocence, and Tom Hiddleston as the dashing suitor from overseas, a handsome aristocrat with a haunted soul whose mystery captures the American’s heart. His calculating sister (Jessica Chastain), however, who dresses in blood red and death black gowns that give her the spiky presence of a predatory insect, has all the warmth of vampire. Suddenly orphaned and swept away to the desolate hinterlands of rural England, she moves into the most haunted manor you’ve ever seen in the movies, a rotting mansion that lets the snow and rain and bitter cold in through the collapsed spire of the roof and literally bleeds red through the floorboards and down the walls. That it is explained away as a geological phenomenon, the churning red clay of hill seeping into the house as it sinks into the hill, doesn’t make it any less ominous. It’s the seeping of that same clay into the winter snows that gives the hill its name. Though it draws inspiration from Rebecca, Notorious, and Jane Eyre, the sensibility is pure Del Toro. Not the American action movie maker but the creator of The Devil’s Backbone and Pan’s Labyrinth, Spanish horror films of dark fantasy where the supernatural and the otherwordly are beautiful and horrible and terrifying but largely benign. Ghosts are not malevolent monsters or vindictive demons but tormented, tortured beings lost in grief that keeps them stuck on earth, pinned like an insect to the location of their death. It is humans who bring evil into the world. This is old school gothic melodrama with modern movie magic. It’s not subtle, and that’s the point. It is grand and glorious and emotionally outsized, elegantly and delicately florid and Gothic. The ghosts are corpses of blood-red bone and rotted flesh with the markers of their past human lives evaporating around them like gossamer silk dissolving in the air. It didn’t find favor with audiences weaned on more malevolent horrors but I loved it, from its creeping, old-world pace to its deliciously realized metaphors to its steadfast belief in the power of the love to transform the most wretched soul. Beautifully mastered on DVD and Blu-ray, which preserve the intricate textures and vivid, defining colors of the film, with commentary by filmmaker Guillermo Del Toro (whose pride in his work shows through), the featurettes “Beware of Crimson Peak” (a seven-minute guided tour through the manor) and “The Light and Dark of Crimson Peak” (about the set designs and color schemes), and five deleted scenes. 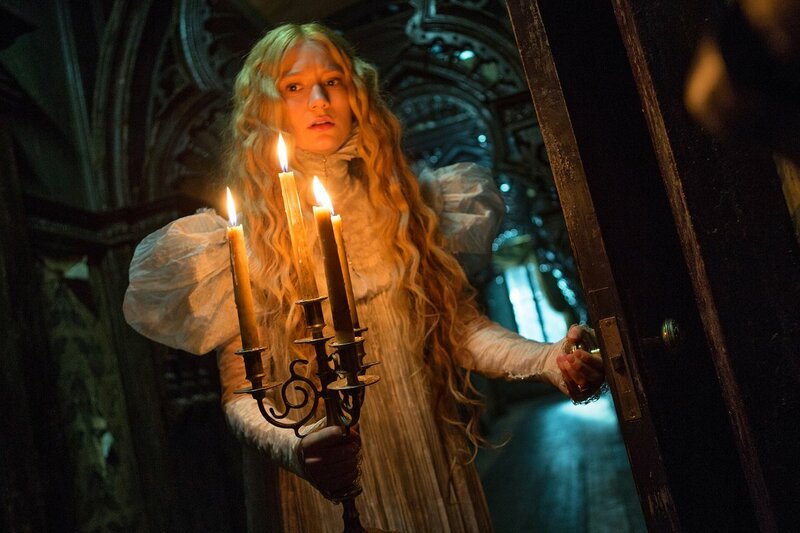 The Blu-ray also includes the four-part “I Remember Crimson Peak,” which looks at four key locations with short featurettes of about five minutes apiece, plus “A Primer on Gothic Romance,” “Hand Tailored Gothic” (on the film’s costumes), “A Living Thing” (the longest of the featurettes, examining the creation of the mansion), and “Crimson Phantoms” (on creating the ghosts), plus bonus DVD and Ultraviolet Digital HD copies of the film. Also on Cable and Video On Demand from Amazon Video and other VOD services.